Four months to the day after a tragic fire nearly destroyed Toledo Metal Spinning’s operation on Clinton Street in Toledo, the company was excitedly announcing its rededication to Toledo by rebuilding in the ashes. “This was the most devastating blow to the company in it’s 70 year history. The fire destroyed 80 percent of our equipment and 90 percent of our space. The reconstruction doesn’t replace everything we had, but we’ll be in normal operation again by the fall,” Eric Fankhauser, co-owner of Toledo Metal Spinning with his father and brother, said, standing in front of the newly constructed facility. Key equipment for Toledo Metal Spinning will be arriving soon from countries such as Germany, Italy, Poland, Switzerland. Several U.S. manufacturers will also be providing new equipment. These companies have also agreed to produce the equipment without their normal lead time for manufacturing, according to Fankhauser. 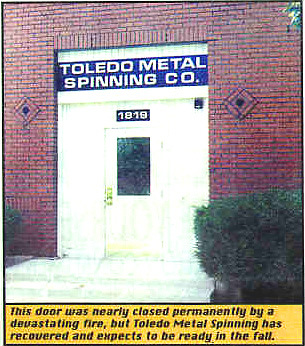 The rebuilding efforts started just after the fire, when Toledo Metal Spinning continued to ship parts from the surviving inventory within days of the disaster. Only the welding, washing, and shipping departments had survived the fire without major damage, Fankhauser recalled. 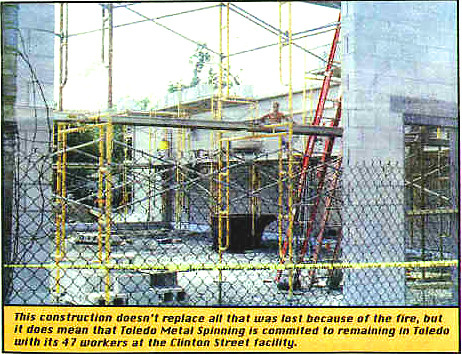 Within six weeks of the crippling fire, the company had constructed a 6,500 square-foot building over the old facilities footprint. A new 11,000 square-foot facility is currently under construction. Besides keeping its doors in Toledo open, Toledo Metal Spinning has made a commitment to Rossford to establish a new 12,000 square-foot facility. The company is waiting on zoning changes and road improvements before starting engineering on the new facility on over 40-acres of land it owns, according to Fankhauser. The City of Toledo has also presented an economic development package to Toledo Metal Spinning for the $7,710,000 Clinton Street project, according to Toledo Mayor Carty Finkbeiner. Toledo Metal Spinning provides products to over 500 customers worldwide in aerospace, plastics machinery, lighting, water purification, railroad, automotive, distillation and nuclear products.